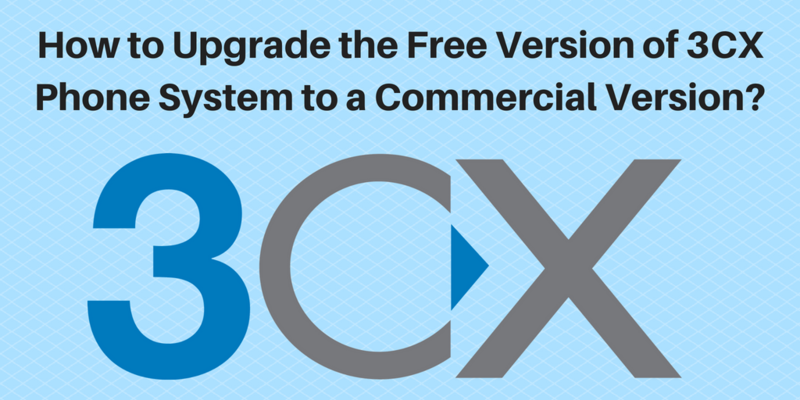 How to Upgrade the Free Version of 3CX Phone System to a Commercial Version? 3CX provides call switching, routing, and queueing. The web-based interface makes the configuration and management as easy as a breeze! With 3CX phone systems, you are able to monitor phone status simply from a web browser. While the free version of 3CX is popular, many people are looking to upgrade to one of the commercial versions for more advanced capabilities. How? It’s fairly easy. Let’s take a look! 3CX Free version vs paid version: What are the differences? 3CX is priced as an annual license/subscription based on the number of simultaneous calls you need. The free version gives you the capability to handle up to 16 simultaneous calls for free for one year, including hosting. All editions provide basic functionalities such as web-based configuration and status indication, auto attendant, unified communications. However, the paid versions of 3CX give you more advanced features such as advanced real time queue statistics, advanced agent statistics, call back feature, and more. You can easily upgrade your free version of the 3CX software through a unique activation license key provided to you via email after your purchase. You can then apply it directly from the 3CX admin GUI configuration. Updates are instantaneous after you apply them. They are based upon the maximum number of concurrent calls you will have on your solution, and can be easily upgraded to a higher amount of simultaneous calls if needed. Once again, changes are done via the web GUI and are instantaneous.